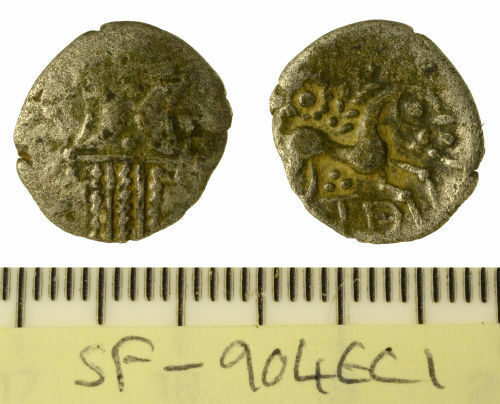 This coin was found on arable land within the area of a previously known coin hoard of Iron Age silver units reported in 2005 (2005 T367), 2006 (2006 T112) and 2012 (2012 T224). This coin is being submitted for consideration as addendum to the previous hoard since it comprises more than 10% precious metal content and is of similar date and type. I would conclude that this coin represents an addendum to an earlier hoard and as such should be regarded as a prima facie case of treasure under the terms of the Treasure Act (1996).